Home » Uncategorized » Ready to Talk About Your Summer Vacation? One book I love to use at back to school time is “How I Spent My Summer Vacation,” by Mark Teague. It is a fun book to use as a lead-in to students writing about their own vacations. Its exaggerations are humorous, and can be fun as a modern-day tall tale. The hero of the story is a boy who has a wild imagination. His parents hope that sending him out West to his Aunt Fern’s for the summer will give his overactive imagination a rest. But when he returns, the story he tells his classmates is full of kidnapping by cowboys, Wild West outfits, cowhand tricks, and charging bulls. There are a number of problems within the story that can each be used separately to talk about the story elements, problem-feelings—solution triangles, and sequences. You can use the old Somebody- Wanted – But – So frame to retell the story or each of its episodes. Or you can use any other story element or sequence structure. 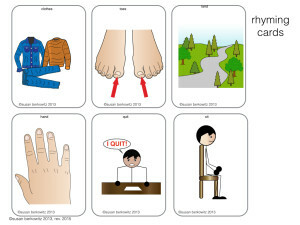 The book is able to be distilled down into a 3 or 4 picture sequence if that’s what your students need, or all 12 elements of the book can be sequenced out. 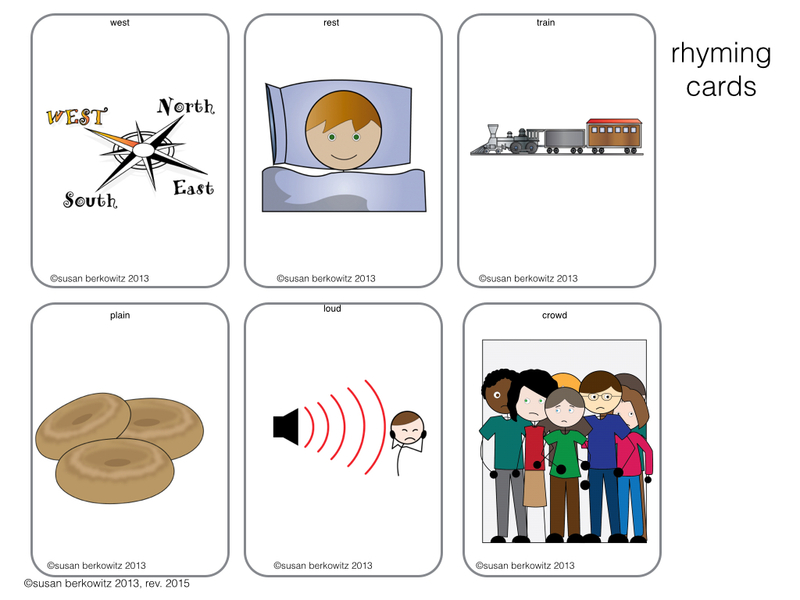 And, for working on emergent literacy skills – it’s told in rhyme! When I use it I capitalize on the rhymes in the story to focus on some phonological awareness activities. I have rhyming words cards (catch them below) that we use to play a “Memory” type game, as well as some sound substitutions fun, where you swap out a letter/sound in one word to make another. Since “cow” comes up a lot in this book, that one’s easy to find word family members for. “Train” is another. I haven’t figured out how to use “matador” yet. Mark Teague is a master humorous story-teller, as evidenced by all of his books. I haven’t used any of the others yet, but I know I’m going to have to try them. I have used this particular book with kids with autism, kids with language disorders, and kids with learning disabilities, so it’s got lots of possibilities for any group.i If you want to see what I’ve done with it, check out my Teachers Pay Teachers store for the materials here.